The first time we visited The Point at Polzeath we were on a Cornish holiday in our campervan and had dropped in to their annual beer festival for the afternoon. A fun day of beer tasting, live music-appreciation and outdoor game-playing ensued but I do recall wistfully eyeing up some holiday cottages run by the complex as I bundled the four of us into the cramped confines of our VW camper that evening. That was a few years ago and since then, The Point has built more holiday homes: this time a brand new development of – very roomy – eco-friendly holiday apartments. And we were lucky enough to be amongst the first to try them out. 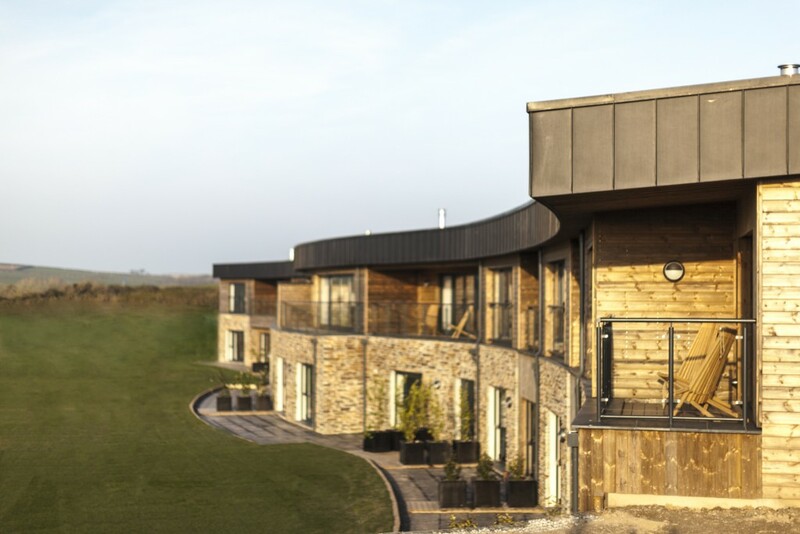 The holiday haven, which has an 18-hole golf course, health club, pool, restaurant and bar, lies in the hills above popular Polzeath surfing beach and the new apartments are the brainchild of owners Jeremy Davies and his Norweigan wife Eva. Her Scandinavian influence is evident throughout the build. First, the feeling of space. Our apartment, Malin, was light, airy and… huge. No country-cottage feel here. No confines of a campervan. Think clean, open, fresh and uncluttered. On the first floor, a gorgeous open-plan living and eating space with quality kitchen, dining area and relaxation space with sofas plus a log-burner. Floor to ceiling sliding doors let in the outside view (in the distance, the sea peeps through between farmland and the cliffs of Pentire Point.) and private terraces with chairs are perfectly poised to share that vista. Downstairs, one double bedroom with ensuite shower room, two twin rooms, a large family bathroom with bath and walk in shower, plus a huge utility room with washer, drier and plenty of drying space for wetsuits. The smooth stone flooring is cool to the foot in summer but thanks to underfloor heating from eco-friendly ground source heat pumps, will be toasty in winter. All in all, the interior has a real 5-star feel. The seven adjoining apartments are built into a ‘wave’ shape sitting in a hill ridge, designed to fit into the landscape with minimum impact. They have living sedum roofs, use local stone and are cladded with Kebony wood – the sustainable lower carbon-footprint, alternative to tropical hardwood. This wood is tried and tested in harsh Norweigan climates, so the sea winds that batter Polzeath shouldn’t be a problem. The wood will age gracefully, developing a silver patina, without the need for environmentally damaging treatments. The Point has its own gym and health club so while my other half joined in with the popular spin class, the boys and I headed to the pool for a swim, Jacuzzi, sauna and steam (yes, we had to try it all). We also played an extremely blustery game of tennis on the courts, plus the boys enjoyed some golf tuition from an on-site PGA Professional. There’s also a family-friendly on-site restaurant and bar serving breakfast, lunch and dinner. We enjoyed a morning coffee plus an evening beer sunning ourselves on the balcony. A footpath right outside the apartments which passes over the golf course and then through some woodland (it took us about 15 minutes) leads you to Polzeath village and the beach. It meant we could happily wander there in wetsuits and enjoy some bodyboarding. Then a brisk walk back to the apartment and we were almost dry by the time we got ‘home’. Ready for a warm shower and a pre-dinner drink at the bar. Bliss. You can read more about Polzeath and what we did in the surrounding area in a post coming soon. More information: Prices start from £140 a night in a two-bedroomed apartment.